AVOX Max for Live update version 1.1.6 released. Now you can control beat tempo independently from the tuning of the device. In AVOX Max for Live version 1.1.6 you can switch from automatic key detection to a manual using two available controls. You can also resynthesize the song tone on the fly while using Ableton Live BPM control to switch to a different tempo. The solution works on PC and Mac using Max 6 or Max 7 Max for Live. The main difference from the previous version is that AVOX Max for Live has a switchable scanner with automatic frequency detection algorithm. The main idea of switchable communications as with AVOX Max for Live vocoder/resynthesizer is to enable a radio translation over the 20 Hz – 20 kHz passband music. 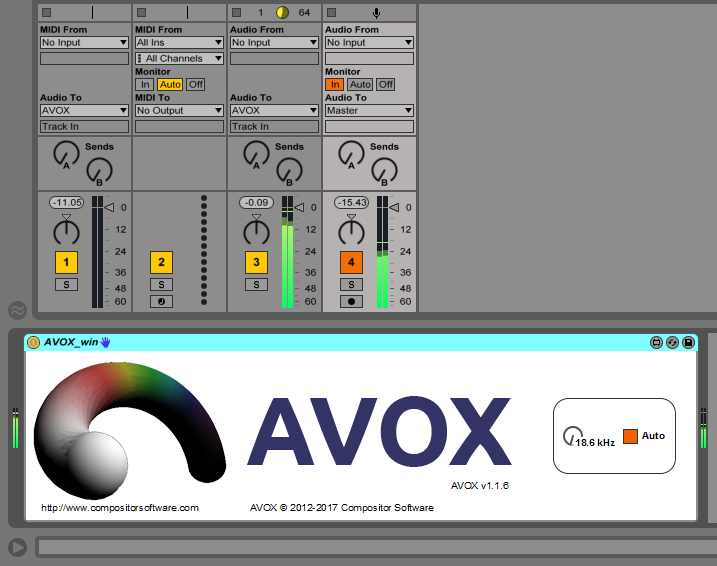 AVOX Max for Live modeled to suit modern styles of electronic dance music. The spectrum of EDM songs is especially useful to detect ongoing radio translations feeding the track to AVOX Max for Live input and analyzing the spectrum with the use of CW Decoder as an example. This way you can review old translations, which were at the moment of the track first listening. For example, you have a legitimate file of the track, which you bought ten years ago. Now, with the use of the AVOX Max for Live you can revive the emotions you had at the moment of the first listenning analyzing and reading a text output of what inspired you in that music in a first place. Yes, every track has a radio translation over it and you can control and revive it using Compositor Software instruments. However, this approach raises a term of the protection of such communications. It is very important to not to share the output of the translation to a 3d party. Such translations can contain loads of private information such as gathering points, events, and simply communications, you do not want to share with others. This way an automatic mode of AVOX Max for Live is as important as it helps to quite the frequency band the translation goes on, when 3d party tries to key it. Automatic scanner made by Compositor Software artificial intelligence proprietary algorithm can be found on all Compositor Software instruments. Buffer overrun protection is also included in a new version of AVOX Max for Live.